Showcasing a resurgence in the Côte d’Ivoire economy, the opening of the nation’s most extensive shopping mall is transforming lives in the commercial capital Abidjan. Spread across three hectares, Cosmos Yopougon is the most expansive shopping center in the country and, significantly, bucks the format of other large-scale malls that have mushroomed in the wealthier parts of Sub-Saharan African cities. Yopougon, the most populous district of Abidjan, is predominantly a lower middle-class area where most consumption is through informal retail and street stalls. Some of the retailers in the mall’s kiosks are former stallholders. The mall has exceeded half a million shoppers since opening six weeks ago, a record for a commercial center in Côte d’Ivoire. 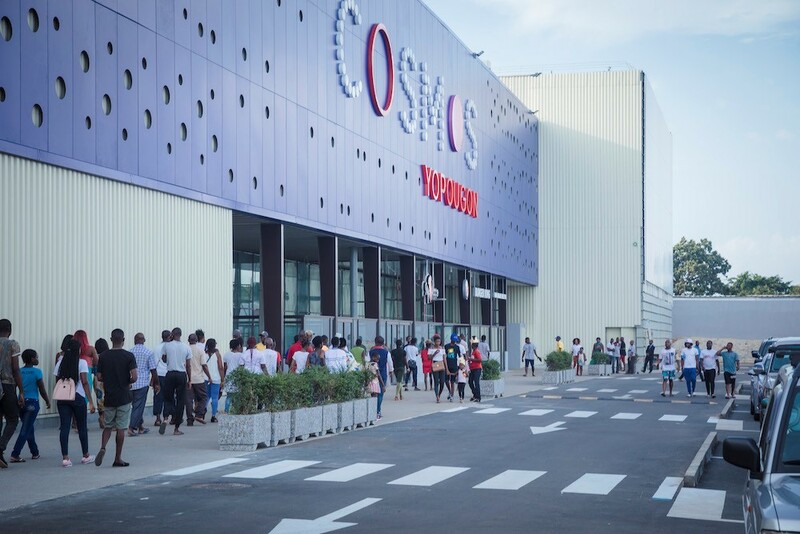 The country’s first leisure-to-retail complex, Cosmos Yopougon features a Carrefour Market supermarket, a 700-seat three-screen Majestic Cinema, an innovative children’s learning and play area, a food court, 60 stores and 30 kiosks – all connected with help from state-of-the-art digital way finders. Ivorian Prime Minister Amadou Gon Coulibaly asked local leaders at the opening ceremony if they could have believed this would be possible just a few years ago. President Alassane Ouattara has sought to prevent any repeat of the civil wars of 2002 and 2011 through a restructuring of the army coupled with economic policies that include infrastructure projects and attracting international investors. The world’s fastest-growth economy in 2016, Côte d’Ivoire is forecast by the World Bank to have the fourth highest rate of real GDP growth this year and leads among nations recovering from serious conflict during the past decade. Household consumption spending has shown double-digit annual growth since the last civil war ended, spurring retail sales rising in line with GDP. Yet, despite improved spending power, 46% of the population is below the poverty line,according to the African Development Bank. Most Ivorians now live in the larger cities, with urban residents increasing to more than half the population in the past decade. Having created over 500 construction jobs, Cosmos Yopougon brings a further 750 permanent positions, which in turn will directly sustain an estimated 938 new informal sector jobs – more than half of those for women and youths. The center has actively sought to attract street vendors – who often struggle to cover their most basic needs – into the formal retail sector by offering leases inside the mall for as little as a month and smaller kiosks that don’t require the kit out and stock levels that shop units would. Demand for these kiosks has been triple the amount available, with artisans selling everything from artwork to local wines and teddy bears. This push toward formal retail is meaningful in a country where most groceries are purchased on the streets and only 35% from supermarkets, according to Oxford Business Group. The issue comes down to a lack of investment in retail targeting lower to middle class households, says Cheick Sanankoua, the Abidjan-based co-founder of HC Capital Properties. First-time formal retailers and low-cost stores such as ‘Bonus tout à 1000 franc’ that didn’t previously exist in Côte d’Ivoire mix with global brand leaders. Orange and MTN are seizing on the mall’s broad catchment area to drive their mobile money offerings, establishing their flagship stores for the country at Cosmos Yopougon. Carrefour Market has broadened its range of food to include items typically found in the street markets, such as local smoked fish and attiéké, an Ivorian staple made from fermented cassava pulp. Cosmos Yopougon won recognition from the International Property Awards as “Best Retail Development in Côte d’Ivoire 2018” and ranked No. 2 on the continent overall for “Best Retail Development” in the Africa Property Investment Awards 2018. The first direct investment in the African continent for SFO Group, Cosmos Yopougon is part of a global real estate strategy targeting opportunistic risk-adjusted returns by identifying superior quality investments and partners. “This award-winning shopping center crystalizes our Group’s strategy and proven capabilities to access frontier markets, with a deep understanding of local dynamics,opportunities and challenges, as well as our commitment to contribute to creating jobs, improving income levels, enhancing working conditions, and promoting sustainable growth,” added Mario Saradar. HC Capital Properties is a privately-held investment management firm specializing in real estate in West and Central Africa. Founded in 2014 by Hafeez Giwa and Cheick Sanankoua, the company invests in and develops commercial real estate assets in the largest and most important countries in the region. Its investments specifically target the middle and lower middle class and its consumption and lifestyle needs, the young population and other long-term trends such as urbanization that drive positive prospects for investing in real estate. The HC Capital Properties investment team, supported by a dedicated advisory and operations group, is located in offices in Abidjan and London. Recognized as the Best Real Estate Investment Company at the World Finance Awards 2018 and as the Levant Real Estate Investment Firm of the Year at the 2018 Global Investor MENA Awards, SFO Group is an independent multi-family office with a focus on global real estate investments. SFO has a proven reputation for successfully identifying, acquiring, and managing real estate assets globally. SFO is a member of Saradar Capital Holding, an active and diversified investment holding that has been at the center of the Lebanese financial sector for over 70 years and employs more than 2,000 people.